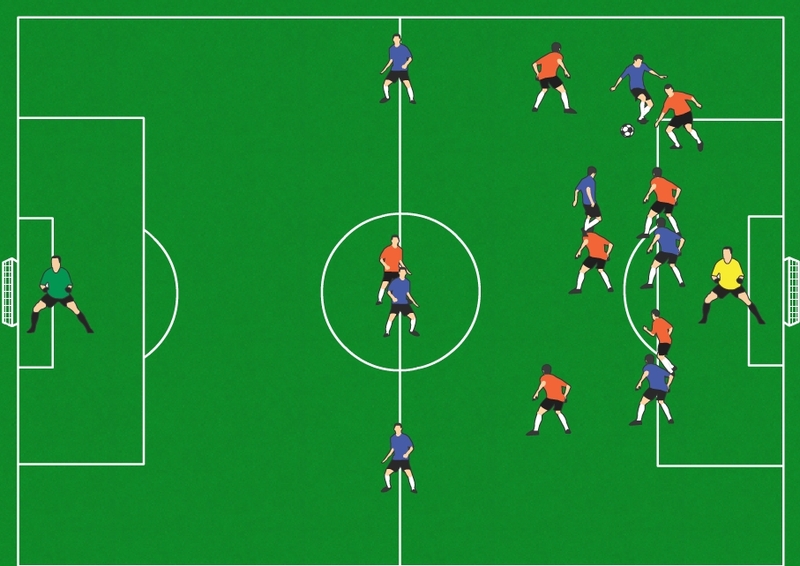 Last in the series of 8v8 3-3-1 positions is the center forward, or striker. Forwards are the most celebrated players in the team because they are often the ones who score goals. Accuracy, head ability, and ball control are the typical qualities of a forward. A forward does not have to do as much work as the midfield or defense but he must be able to convert when his teammates give him the ball. 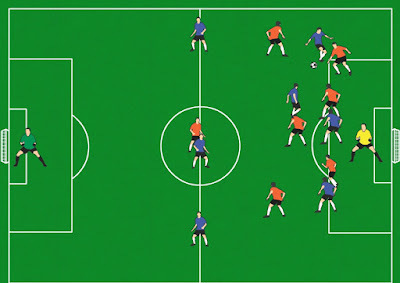 Center-forwards (CF) are positioned closest to the opponent’s goal. They have two roles: first, they score goals through passes from teammates; second, they distract the defense to give room for the attacking midfielder or winger to attack. A striker must be brilliant at receiving and controlling the ball, must be strong, and capable of winning the ball in the air. Skills at playing with the back to the goal is a prerequisite. The opponents in blue have the ball in our zone on our right side. You can see the CF in the center circle in line with their defenders but not offside. If our right fullback is able to win the ball, he can pass up to the right midfielder and then get a sharp pass through the opponents defenders into the space behind them, allowing our striker to run into space and attack the goalkeeper one-on-one, where the odds are strongly against any goalkeeper. As mentioned earlier, control is key for a striker, especially dribbling and shooting while on the run. When our defense holds and we begin our counter attack, the CF will be in position for a breakout if a through-pass gets made. The striker needs to be aware of his positioning and make sure he's not offside. We had more than a few cases in our first game where our forward was caught offside and it killed our attacks, including one goal called back. One problem we see a lot is with one-on-one defending when an opponent is bringing the ball into our zone. Too often our defenders will run up and try to stab at the ball, which is absolutely the wrong thing to do. If the attacker has control of the ball, he/she will easily just dribble around the tackle attempt. This leaves our defender doing the splits and unable to recover, meaning now the attacker has one less (or even no one) covering him/her. What we want to do is pressure and contain the attack, slowing them down and forcing them to one side away from the goal. Remember, the sideline is a defender's teammate. If you can direct an attack toward the side and contain it, there's a good chance the ball will be turned over out of bounds. Otherwise the attacker might have to stop and pass back, or the attacker will make a bad touch and we could win the ball. Either of those three scenarios is a defensive win. Don't try to take the ball unless the attacker makes a bad touch and the ball is loose! The defender MUST be patient in this situation and remember that his job is not to tackle the ball every time, but rather to slow the attack, direct it away from the goal and pressure the attacker into making a bad play or pass back. 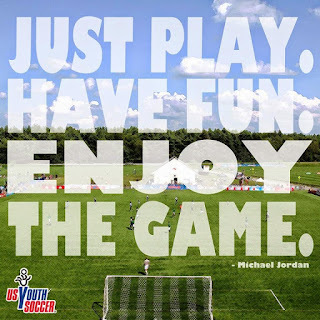 As we begin our season, we need to make sure we have the fundamentals in place to play soccer, and it doesn't get any more fundamental than passing the ball to a teammate, and trapping (or receiving) a pass from a teammate. So often a bad pass or bad touch can lose an advantage by either slowing the attack or turning the ball over. We need to be a solid passing and trapping team in order to do anything else. In this post we'll discuss basic passing and trapping techniques to give the kids an idea of what we're looking for going into the first practice. In this post we'll focus on the defense, which means the backs and goalkeeper.